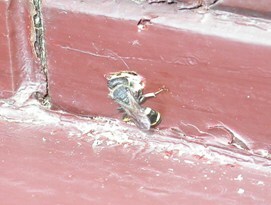 Timberwise»Blog»Case Studies»How Wood Wasps Can Affect Your Property? How Wood Wasps Can Affect Your Property? What is a Wood wasp? The Horntail also generally known as the ‘Giant Wood Wasp’ or even ‘Greater Horntail’ which is a large sawfly, is usually discovered near pine woods, or even locations in which pine timbers are utilized. A wood wasp or a horntail infestation can be easily confused with woodworm infestation. As a member of the wasp family, the female is black and yellow-coloured, with a very long ‘sting’. This is her ovipositor, which she uses to penetrate into the timber to lay her eggs, specifically in timbers such as pine. Within a suitable environment, located by the wasp, it is able to release its eggs from the ovipositor, implanting them deep into the timber. Over time, the whitish larva develops and evolves into an insect with six legs and jaws strong enough to gnaw its way through the solid wood. The larva commences its excavation of a lengthy tunnel, it can take up to several years for the larva to reach maturity. Once at this phase, it spins a silken cocoon and then transforms into a pupa that has produced its own limbs and wings folded beside its body. However, before preparing its own cocoon, it requires a protective level before preceding its journey to tunnel out of the internal bark. This ensures that in its winged state it has to simply bite a path through the softer obstacle to its freedom. What damage do Wood Wasps cause? Although similar to caterpillars, a wood wasp will not hesitate, when necessary, to make its way even through soft metal such as lead and silver. There is even a record of a Sirex (a type of wood wasp)-infested tree having been cut to create rafters that were utilized in the construction of a roof area. The rafters were also protected with sheet-lead an eighth of an inch thick. The Sirex within the timber had desires for its freedom and although the path had been blocked by lead went right through it with ease, finding lead not much more difficult to handle than bark. When are Wood wasps active? This is type insect cannot be treated as the wasps’ only attack unhealthy trees and newly felled timber as it needs moisture to develop. Once the timber is cut it is not possible for a re-infestation to take place as the timber is too dry. However, in this particular case discovered by our Timberwise Shrewsbury surveyor the timber had already been infested and the larva had come to the end of the developing stage of the life cycle and were, therefore, ready to exit the timber. The resulting damage to the new strip of oak flooring is shown below. The telltale signs of the wood being damaged are densely packed bore dust and large emergence holes. If you believe you may have an infestation of horntail wood wasp the same situation it is highly recommended that you get a qualified surveyor to inspect your property to identify for certain the cause of the damage. Not sure if you have woodworm or wood wasps? Do you need a second opinion to confirm an infestation? For help and advice on timber infestations within your property, simply complete our on-line survey request form to arrange a surveyor to visit.